﻿ Chagrin Valley Roller Rink - Ohio. Find It Here. 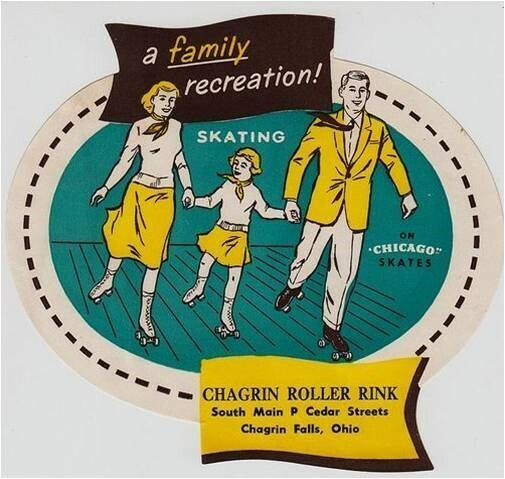 Chagrin Valley Roller rink is a historical landmark of Geauga County for over 70 years and is family-owned and operated. The rink opened its doors on Thanksgiving Day in 1947. Although originally thought by many to be an airplane hangar; the building was originally constructed as a roller rink utilizing a WWII quonset hut structure typical of the time period. The building is all original, including the maple wood floor, restored in 2014 and rich in history, as it is the same floor your parents and grandparents skated on years ago. The rink has flexible hours to accommodate busy schedules. The convenient location is just outside of downtown Chagrin Fallls and close to the OH-306 exit off Route US-422 located between South Street and Cedar Street.Allyson Kindlesparker, owner and lifelong employee and rink patron is one of only a few select people in the world to earn all 30 artistic dance medals in roller skating. This amazing achievement took 18 years in order to learn 105 different routines.